Cotton – a natural fiber – has been used to dress and protect families for at least 7,000 years. Of the thousands of U.S. cotton growers – predominantly family farms – 100% of them are committed to continual improvement that positions U.S. cotton to support society’s quality of life for future generations. Accordingly, the U.S. cotton industry continues to research and adopt responsible production practices that not only promote economic sustainability but also minimize impact on natural resources. As a result, since 1980, the U.S. cotton industry has demonstrated continuous improvement against a number of measures, as defined by Field to Market: The Alliance for Sustainable Agriculture, including reductions in soil erosion, irrigation water applied, labor hours, energy use and greenhouse gas emissions. Modern technology has enabled U.S. growers to double the cotton produced from each hectare (acre) of land while at the same time using less irrigation water and fewer pesticides. U.S. conventionally grown cotton fiber and U.S. organically grown cotton fiber are both produced in a sustainable manner and both meet eco-label standards. 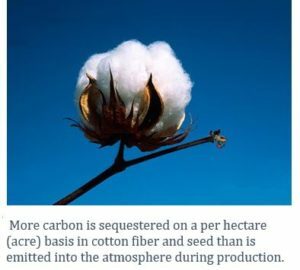 U.S. cotton accounts for approximately 16% (about 5-6 million tonnes) of the 36 million tonnes of CO2 removed by the world cotton crop. In 2008, the most recent period for such data to be reported, 44%of U.S. conventional cotton farms had fields that required no foliar insecticides, and nearly one-third of U.S. cotton production required no insecticide applications at all. The following improvements in U.S. cotton production are reported in “Field to Market: The Alliance for Sustainable Agriculture, 2016 Environmental and Socioeconomic Indicators for Measuring Outcomes of On-Farm Production in the United States.” All reductions are for the 1980-2015 period. S. cotton is a founding member of this alliance. Land use was reduced by almost 50%. Soil erosion decreased by 35%. Irrigation water use decreased almost by 80% on a unit of production per hectare (acre) basis, while also decreasing on an absolute basis by over 50%. Energy use reduced by over 50%. Greenhouse gas emissions decreased by 40%. 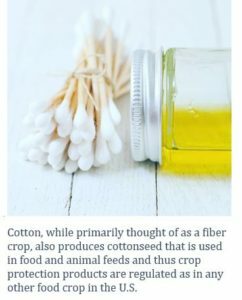 Cottonseed is used for both human food (such as cottonseed oil) and animal feed (including feed for dairy cows) in the U.S. As such, cotton production is regulated as a food crop. Any crop protection products that are used in the production of cotton must meet the same strict regulations as any other food crop produced in the U.S. The non-woven industry is an important product category and includes cotton medical gauze, baby wipes and women’s cosmetic products. In 2015, the U.S. produced 13% of the world’s cotton, and two-thirds of U.S. cotton is produced using only rainfall and no supplemental irrigation. This helps free up the water in underground aquifers for other societal uses. When supplemental irrigation water is needed, farmers use advanced irrigation methods that minimize water use. U.S. cotton is a founding partner of Cotton LEADS®, a program to promote awareness of the responsible practices that U.S. growers use in the production of U.S. cotton. When it comes to fibers and fabrics, Cotton Incorporated’s Lifestyle Monitor™ shows that nearly 90% of consumers say cotton is safe for the environment. The approximately 18,000 U.S. cotton growers comply with stringent U.S. regulatory requirements and are committed to the principle of continuous improvement. The production and processing of natural fibers worldwide employs hundreds of millions of people, particularly in developing countries. Cotton alone generates hundreds of billions of dollars in economic activity as it moves from production at the farm level through processing and retail. In the U.S., the raw cotton industry employs more than 125,000 people and stimulates economic activity of more than €70 billion ($75 billion). Cotton is grown in 17 states, stretching from Virginia to California, covering more than 25 million hectares (10 million acres). The number of labor hours required to produce the U.S. cotton crop continues to decline, with reductions per planted hectare (acre) and per half kilo (pound) of lint of 78% and 82%, respectively from 1980 to 2015. Cotton Incorporated’s 2015 Lifestyle Monitor™ survey results showed that 53% of American consumers would pay more for clothes made of natural fibers such as cotton. Dry beans, a subgroup of pulses and legumes, are climate-smart: they simultaneously adapt to varying climates and use less water compared to many other protein sources.